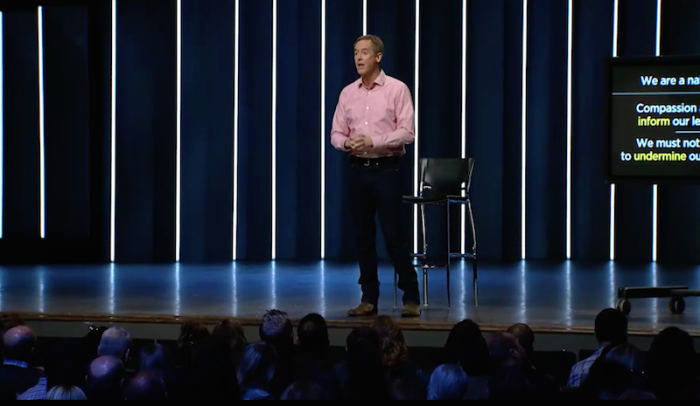 Megachurch pastor Andy Stanley's recent message in which he urged Christians to "unhitch" their faith from the Old Testament continues to draw flak, with some calling it heresy. Both Kevin DeYoung of Christ Covenant Church and Wesley Hill of Trinity School for Ministry are calling Stanley out for what they contend is heretical teaching — namely, Marcionism — that stems from the early church days. "[Mo]st of the 39-minute talk can really only be described as an elaborate and educated flirtation with the old Christian heresy of Marcionism—the belief that the Old Testament is not authoritative in matters of Christian doctrine and morals," Hill stated, referring to Stanley's sermon from April. DeYoung, a Reformed pastor in North Carolina, called Marcionism "the evergreen heresy" that still resonates with people today largely because it cuts out "a God full of wrath and justice" and leaves "a God of goodness and nothing else." Stanley, who leads North Point Community Church in Georgia, preached a sermon series called "Aftermath" last month. The series was aimed at appealing to individuals who left Christianity over something they disagreed with or didn't like in the Bible, particularly the Old Testament. In the final part of the three-part series, he said that while he believes the Old Testament is "divinely inspired," that is not the basis of Christianity. And just as "Peter, James, Paul elected to unhitch the Christian faith from their Jewish Scriptures, ... we must as well," he told his congregation. Stanley called the Old Testament "the back story for the main story" and while it's important, it's also "violent," "disturbing," and "offends all of our modern senses." "Many have lost faith because of something about the Bible or in the Bible, the Old Testament in particular ... once they could no longer accept all the historicity of the Old Testament ... suddenly their house of cards of faith came tumbling down because they were taught it's all true, it's all God's Word and if you find one part that's not true, uh oh, the whole thing comes tumbling down. "Not Christianity. The Bible did not create Christianity. The resurrection of Jesus created and launched Christianity. Your whole house of Old Testament cards can come tumbling down." He added that Jesus' new covenant "does not need propping up by the Jewish Scriptures." Stanley argued that many will find this view "liberating." "It's liberating for men and women who were drawn to the simple message that God loves you so much He sent His son to pave the way to a relationship with you. It's appealing and it's liberating for people who need and understand grace ... forgiveness ..., for people who find it virtually impossible to embrace the ... worldview and the value system depicted in the story of ancient Israel." DeYoung explained in his blog the appeal of this type of teaching. Marcion, the son of a bishop from the first century, was "was one of the most successful heretics in the early church. He grew in prominence for preaching a version of the faith that distanced itself from the Old Testament. Though Marcion was excommunicated by the Church, he was able to win many converts. "Marcion's theological errors (and there were many) came from one main root: he refused to believe that the God of the Old Testament was the same as the Father of the Lord Jesus Christ. Marcion simply could not believe in a God full of wrath and justice," DeYoung explained. Marcion put together his own version of the Gospel, one that "does away with the uncomfortable bits about God's wrath and Hell." "What Marcion couldn't bear was the note of judgment that went along with the preaching of the Christian message, the warnings that came with the teaching of the law, the call to obedience and the threat of Hell," DeYoung noted. "The idea of recasting Christianity for a new day — in softer, gentler hues, more focused on the life of Jesus instead of the wrath-satisfying death of Jesus — is always popular. Some errors never quite die, and some new things are not that new," he warned. Others, such as Michael Brown, host of the nationally syndicated "Line of Fire" radio program, also delivered a harsh warning against Stanley's argument in an op-ed published in The Christian Post last week. "A pastor as influential as Andy Stanley needs to distance himself from such heresies, making a public, clear, and unequivocal correction that undoes the confusion he has caused. (He knows that I write this a friend, out to help, not to hurt. )," Brown wrote.